Greetings! I've got a question for you. When was the last time you explored something new and found it to be a total delight? I mean something that made your mouth and your mind smile. I experienced this recently. I mentioned in my post last week that I visited a new-to-me art gallery called Gallery Arcturus. It is located at 80 Gerrard Street East, by Ryerson University, in downtown Toronto. Admission is free. Gallery Arcturus is actually a public art museum with five galleries in a multi-storey house. When I arrived at the front door, I needed to buzz to be let in. The staff on duty gave me a quick overview of the Gallery and let me wander on my own to view the art works on exhibit. I was there at mid-day, mid-week and had the five galleries to myself. Think "a kid in a candy store". From the ground floor to the top floor, everything seemed to be well-curated and tastefully displayed without making the visitor feel overwhelmed. Although there were many art items on display, for this blog post, I included just a sample of what was on exhibit that I thought was interesting. We all have different tastes for arts and our mood also affects what we see so I'll let the photos "speak" to you and perhaps you see something you like. THE GENESIS GALLERY: This gallery displays installations and new sculpture titled A Serious Matter and overturned by debbie harris. The artist displays her name all in lowercase. THE COLLAGE GALLERY: "from the street" sculpture and cards by Joseph Lammirato are displayed on all the walls in this gallery. There is a paper handout that lists the titles of what's on display on each wall. His sculpture will be on the telephone poles of the city in the next month or so. THE UP NORTH GALLERY: This gallery displays art work by Claustro, McConnachie, and Kimura. Claustro is the husband and wife team (Carol Currie and Stuart Leggett). Eric McConnachie is a northern Ontario artist who has adopted the medium and tools of one of his mentors, Tom Thomson. Most of McConnachie's works are done on small wood panels showing nature and how it changes through all the seasons and light. THE ASCENDING GALLERY: This gallery displays art work by Kimura, Kuptana, and harris. I like the bright colours in Kuptana's paintings. FLOYD KUPTANA GALLERY: This gallery displays sculpture and 2-D work by Kuptana. There is also a library and seating area here, perfect for admiring Kuptana's art works and browsing books. I'm glad I decided to give it a whirl and visit a place that I have not been to before. This is my new whirl 2018.10 edition! It's a total delight to discover Gallery Arcturus. In addition, upon leaving, I received the staff recommendations and a list of nearby museums and galleries with free admission. I look forward to eventually visiting them all. Have you explored something new recently and found it to be a total delight? I'd love to hear about it. Greetings and happy Sunday! About four weeks ago, I wrote a post on my Autumn fun list. Today I'm reviewing my list and providing an update on my progress. Before I get into the details, I want to share with you a photo of a red maple tree because I love autumn colours in Ontario. Artists of the Canadian Opera Company Ensemble Studio "The Best of Rossini"
All of the above performers have very impressive bios. They have performed at prestigious events in Canada and abroad so I feel very fortunate to listen to their performances live. Plus, admission to these concerts is free. Gallery Arcturus was new to me and what a wonderful discovery it was! I plan to write a separate post on it. In the mean time, I'm including a sample of the art work that I've seen at the first three places mentioned. Aside from the art exhibits, I also attended the Indian Residential School Survivors (IRSS) Cultural Gathering and Celebration at Toronto's Nathan Phillips Square. More than twenty painted teepees were set up around the square to offer educational programming and drop-in workshops throughout the three-day event. The event also included the unveiling of a commemorative sculpture of a female turtle crawling over top of a boulder, to signify overcoming struggle. The shell of the turtle has tiles to represent the 13 moons and 28-day cycle. Turtles are symbolic within multiple First Nations creation stories. The sculpture, created by Anishinabe artist Solomon King, is the planned centrepiece of the IRSS Legacy garden. 4. Try three new-to-me restaurants: In progress, 33% done so far. We dined out at Joe Bird, which has a quirky decor (an RV at the entrance, and casual decor inside), nice lake view, and good service. The food was average though so we won't be rushing back anytime soon. 5. Enjoy Thanksgiving with my family: Yes, 100% done! Our Thanksgiving was on October 8. My brother and sister-in-law hosted a beautiful family dinner with turkey and all the sides. We had a lot of fun catching up with everyone and a lot to be thankful for since everyone in our family is doing well. 6. Meet up with my friends for coffee or lunch: In progress. I had one fun lunch date with my friend this week, a second lunch date booked for next week, and a third one booked in early November. My friends' work schedules sometimes change at the last minute so it's great when our dates go as planned. 7. Write a guest post for another blog in October: Yes, 100% done! I'm honored to be the guest writer on Sue's blog on October 18. My topic was Thriving by Diversifying as posted here. Thank you to Sue for featuring me and to all readers and bloggers who left comments. 8. Take a trip to explore Morocco in November: Pending. I booked my flights and accommodations. I've been reading on a few places that I plan to visit in Morocco. I'll continue with my travel planning checklist until departure date. From my list, I counted three items completed, four in progress, and one pending. In November I'll be in Morocco for part of the month so I'll resume going to the fun events in my home city after my trip. Speaking of resuming...I've returned to read paper books. I used to read books all the time then paused to switch to online reading. Now I'm back to books that I borrow from the local public library. I'm currently reading Linwood Barclay's thriller novels. I just finished No Time for Goodbye which grabbed my attention from the beginning to the end. I'll start reading the trilogy Broken Promise, Far from True, and The Twenty-Three this week. How are things going with you? What good things happened? I'd love to hear your update. Thank you to Sue from Sizzling Towards 60 & Beyond for inviting me to be a Guest Writer on her site. It is an honor to be part of her Over 50 & Thriving Series. The terms "diversify, diversifying, diversification" often come up in investment portfolios. They aim to optimize return and reduce risk. I apply the same concept to my Fun and Wellness plans! To find out the Top Five Benefits that I've gained by diversifying my fun and wellness activities, please join us at Sue's site. Just over half an hour's drive from Paris and the Orsay Museum, lies the artists' village of Auvers-sur-Oise. Admirers of Vincent van Gogh and other 19th century landscape painters come here from all over the world to be in the very spots depicted in so many well loved paintings. The village is 7 kilometers long (about 4.4 miles). The best way to discover it is on foot. We made our first stop at the Auvers-sur-Oise Tourist Office to pick up a map and asked a few questions. The weather was cloudy with good chance of rain so we decided to walk the short pedestrian circuit of two hours, as opposed to the longer circuit that would take up to 4.5 hours. 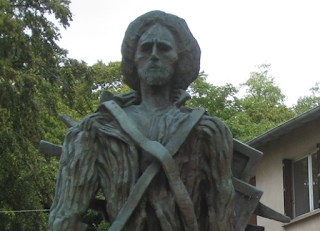 #1) Van Gogh's statue designed by the sculptor Ossip Zadkine in 1961. It is located in Van Gogh Park just outside of the tourist office. #2 and #3) Auvers-sur-Oise Town Hall which was depicted in van Gogh's La Mairie d'Auvers painting. The town hall is across the street from the inn, Auberge Ravoux, where van Gogh spent his last seventy days. #4) Van Gogh's residence at Auberge Ravoux, 52 Général De Gaulle Street, where Van Gogh's room has been left untouched, giving visitors a good idea of the artist's living conditions at the time. There is nothing to see in his room other than a small skylight and an old bistro chair. During his stay at Auberge Ravoux, Vincent van Gogh painted seventy eight paintings. Among these were a dozen or so portraits, two of which depict Adeline Ravoux, the thirteen-year old eldest daughter of the innkeepers Ravoux. #5 and #6) Walking towards the church Église d'Auvers, we passed by the Daubigny Museum and the steps where Vincent van Gogh painted L'escalier d'Auvers. #7 to #9) The church, Église d'Auvers, in the Romano-Gothic style surrounded by a bell tower, is characteristic of the region. Vincent van Gogh painted it on June 3 and 4, 1890. It is now a master piece of the Orsay Museum. We were able to go inside the church and took photos. The church exterior was under restoration and had some scaffolding behind the bell tower. #10 to #12) The houses in Auvers-sur-Oise looked pretty with their painted windows and doors, or greenery and flowers along the walls. Part of the walk is uphill, providing a good view of the village. #13) The graves of Vincent van Gogh and his brother Théodore in the Auvers Cemetery: Vincent van Gogh arrived in Auvers on May 20, 1890 and died on July 29. He was 37. His younger brother, confidant, and primary supporter, Théodore, died of syphilis six months later at age 33. The weather forecast was right. As we approached the cemetery, it started raining, first lightly then it became heavier. We were pleased to complete the short pedestrian circuit and saw several key landmarks in Auvers-sur-Oise on this visit. Are you a fan of Vincent van Gogh's art? Which of his paintings do you like most? Please share. 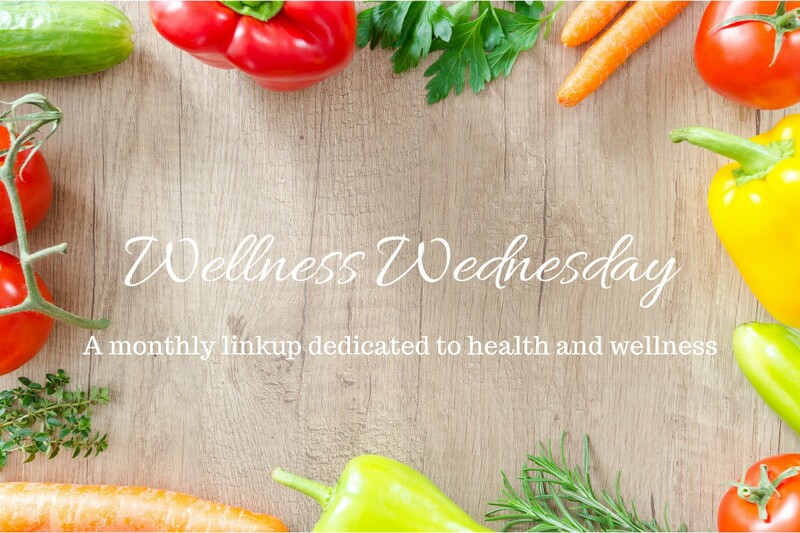 Welcome to our 10th Wellness Wednesday link up in 2018! In this post, I'll share my September wellness goal updates and my October wellness goals. After I returned home from France, I enjoyed having access to a gym and a swimming pool again. When I'm at home, I can do all my fitness activities consistently, unlike the modifications that I need to make when I'm traveling abroad. So let's see how I did in September. Meditate 15 minutes daily - Yes, this got done first thing in the morning and/ or before bed. Smile or laugh daily - Yes, and I'm grateful for all the positives in my life. Walk 45 minutes or more daily - 100% done, as I enjoy my morning walks, and walking is my primary mode of transportation. Work out in the gym three times a week, one hour each time (Mon/Wed/Fri) - Done nine times out of twelve dates. 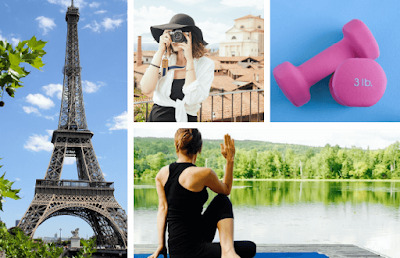 The other three dates I modified my workouts when I was in Paris without access to a gym. Practice yoga twice a week, one hour each time (Tues/Thurs) - Done eight times out of eight dates. I did three yoga sessions by myself, and attended five instructor-led Hatha yoga classes in September. I'm mixing self-directed yoga with instructor-led sessions to give myself variety. Swim one hour weekly (Saturday) - Done four out of five Saturdays in September. I missed one when I was in Paris without access to a swimming pool. Run 5K and do stretches one hour weekly (Sunday) - Done four out of five Sundays in September. October wellness goals: I'm keeping similar goals as in September, except goal #7 as shown below. I signed up for a 5K running race which is coming up on October 21. It's a big race with thousands of international 5K, half marathon, and marathon runners. My preference is to run in much smaller races but there isn't one close by and this may be the last race before the weather becomes too cold to run outdoors. I hope it will be dry and not too windy on the race day. Walk 45 minutes or more daily. Work out in the gym three times a week, one hour each time. Practice yoga twice a week, one hour each time. Finish a 5K running race. The optional prompt this month is Cancer care tips. According to the Canadian Cancer Society web site, cancer is the leading cause of death in Canada and is responsible for 30% of all deaths. However, there are steps that we can take to stop cancer before it starts. I'd encourage you to review the It's My Life! presentation here to learn how to reduce the risk. The web site also offers many ways we can help someone with cancer (or someone who is caring for someone with cancer). I've referred to this page for information when I helped someone in my circle of family and friends going through their cancer treatment program. Your turn...How are you doing with your wellness goals? If you have any cancer care tips, please share. Greetings! My blog's second birthday is on October 10. I've got a photo of a seasonal cupcake to mark the occasion. Natalie the Explorer readership has grown well, based on the volume of comments that I've received. My sincere Thank You to everyone who has read my posts and sent me your comments. I greatly appreciate our virtual dialogues in this space. What's my intention for this blog? When I started Natalie the Explorer on October 10, 2016, I intended to use the space to document my explorations in my home city, my travel adventures, and my attempts to live a healthy and fun life as fully as I can. Two years later, my intention stays the same. I have ideas and experiences to write, just not enough time to do them quickly enough, and that's OK with me. Where is the fun so far? I enjoy the creative process of writing down my thoughts, sort and attach some photos to my posts, and publish the finished posts, without accumulating paper as I used to do when I maintained my journals. I enjoy reading other blogs and experiencing the unique writing styles as well as how different each site looks. I also enjoy the virtual dialogue that occurs when I receive comments and reply to comments. Best of all, I feel that I'm making connections with a few bloggers across the miles, and I'm hoping that we'll meet in person one day. In the next few weeks, I plan to do some general clean up on this site, such as choosing a new design theme, removing outdated posts, organizing my labels, and giving more thoughts to what I'd like to focus my writing on in the new year. What format or content changes would you like to see made on this blog? I value your opinion, and look forward to receiving your honest feedback. Greetings! My September started on a very happy note in Paris and continued to be a fun-filled month after I returned home. The weather was still warm and became more pleasant with less humidity. I was out and about every day in September to enjoy this transition time from summer to autumn. When a new day looks like the one in the photo below, I'd like to make the most of it. FITNESS - My September wellness goals, as posted here, kept me active every day. I'm very pleased with my progress and will share the details at our Wellness Wednesday link up on October 10. Feel free to join us, whether you just started working on your wellness plan or having been taking good care of your health for a while. One outdoor concert by the DATU band, a modern Filipino music group. Four excellent indoor concerts performed by The Bedford Trio, Amijai Shalev, the Toronto Symphony Orchestra Cello Section, and the Artists of the Canadian Opera Company Ensemble Studio. The variety of musical instruments used in these concerts was quite interesting, from classical piano, violin, cello, to Filipino gongs and drums, to bandoneón which originated from Germany and became popular in Argentina, to a saw played by David Hetherington. I also like the floor-to-ceiling glass design of one of the Canadian Opera Company amphitheatres. Two in-flight movies (Justice League and Tomb Raider), and four movies with our neighbours (Adrift, Ocean's 8, Tag, and Solo Star Wars). I liked the action-comedy movies but didn't enjoy Adrift and Tag which were based on true stories. Admired arts in Paris while wandering here and here. Continued my online French and Spanish lessons daily. Wrote seven posts on my blog, and one guest post for October. Viewed five art exhibits in Toronto: Shadows of Flowers by Jamila Alhaib, Nordic Glass by various Scandinavian artists, art work collections titled Joint Efforts, On Any Given Day, and the fifteen finalists of the RBC Canadian Painting Competition 2018. Each of the art exhibits that I attended is post-worthy, unfortunately I don't have time to write them up so please see sample photos below. one big family BBQ/ gathering to celebrate my nieces' birthdays. five coffee dates with my friends. five lunch dates with my friends at different restaurants as posted here. TRAVEL - I had a fabulous time with my family in France and returned home with lots of photos to sort out. There is at least one more international trip that I want to take before the end of 2018. I chose to visit Morocco in November so I'm now in travel planning mode. A new adventure awaits! Overall, September was a splendid month for me. I look forward to making October a fantastic month, and enjoying the activities on my Autumn fun list. How was your September? What good things happened? I'd love to hear your comments.